October 22, 2011 – Congratulations Jut and Nora! October 22, 2011 – The Schuylkill Haven Fire Department and members of the Liberty Fire Co. would like to congratulate the new Mr. and Mrs. Justin Peel who were married on October 22, 2011. Officiating was the Rev. Dennis Snyder (aka Rev.) with the wedding and reception held at the Landingville Fire Hall, Landingville, PA. Everyone had a fantastic time and we all wish Jut and Nora a very happy future together. More photos coming soon! 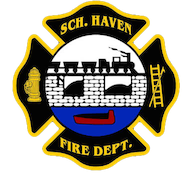 The Schuylkill Haven Fire Department reminds everyone to change the batteries in your smoke alarms, practice safe escape routes with your family, and if you need any warning stickers (such as: children, pets, or invalid) please stop by one of the three fire companies in the borough and we will take care of you! Avoid grease build-up in the kitchen and on appliances. Cooking fires are common. Don’t leave food cooking on stove tops unattended. October 10, 2011 -At 07:54 Stations 1,2, and 4 were dispatched along with Fire District 41 (Cressona) to 2417 Panther Valley Road, North Manheim Township for a house fire. SCCC advised all units of possible smoke and fire on the 1st floor of a residence. Chief 41 (Mansell) arrived on scene and was met with a fully involved house fire and immediately requested a second alarm. E-737 was the first of the SHFD units to arrive on scene and positioned behind 41-17 on side B of the structure. E-732 arrived and reversed laid down the driveway of the residence and set up a dump site for the incoming tankers. Crews from Station 2 & 4 also setup a dam in a creek near the bottom of the driveway and quickly established a water supply to E-737 and Ladder 725. Manpower from all companies assisted with fire suppression, and overhaul. All SHFD units were on scene for approximately 5 hours. Chief 41 (Mansell) was in command of the incident. October 8, 2011 – At 16:01 Stations 2 & 4 were dispatched to 402 3rd St for a medical assist. Crews assisted EMS with patient care and transport to the ALS unit. Chief 720 had command. October 7, 2011 – At 23:42 Stations 1 & 2 were dispatched to 110A Route 61, the church by PSU, to set up a landing zone for incoming Medevac 7. Crews arrived on scene and established secure area for “the bird” to land. Chief 720 had command and all units were cleared shortly after take off. October 7, 2011 – At 14:01 Station 4 was dispatched to for Tanker 738 to respond to 446 Deturksville Road as part of a Tanker Task Force for a working building fire. Chief 58-08 arrived on scene and confirmed a working fire and shortly after, requested Station 2 to setup a fill site at Pete Reber’s Dam (Church Road). Station 2 arrived on scene with E-733 and established the fill site, while Tanker 738 hauled approximately 4,000 gallons of water to the fire. Manpower from T-738 was also sent to the fire to assist with fire attack and overhaul. E-733 filled approximately 13 Tankers. All SHFD units were on scene for approximately 2 hours until being released. Chief 720 had command. Photos via Coal Region Fire & “Squid”. October 6, 2011 – At 14:11 the SHFD was dispatched to the area of 970 East Main Street for a vehicle accident with injuries. Crews arrived on scene and assisted EMS with multiple minor injuries. Fire Personnel also contained the fluids on the roadway and assisted with traffic control. Chief 720 had command. October 6, 2011 – At 12:40 the SHFD was dispatched to the area of 308 Route 61 south for a vehicle possibly into a building. Chief 720 (Peel) arrived on scene and found nothing. All units were then placed available. October 4, 2011 – At 15:05 the SHFD was dispatched to the area of 270 Route 61 (Sheetz) for the report of a vehicle accident with entrapment. Crews quickly arrived on scene and found a vehicle rolled over with no injuries but fluids down. Crews secured the scene and applied floor dry to the area around the vehicle. All units were then placed clear and available by Chief 720. October 3, 2011 – At 13:35 Station 2 was dispatched 1 Orchard Street, Pine Grove Borough for a stand-by in Station (PG HHL) as District 58 units were out on a working barn fire. Crews stood-by for approximately 90 minutes until being released.